StoreSMART's Magnetic 2-Pocket Tracker are one of those products you won't be able to live without once you give them a try! They're a brilliant display solution for a variety of issues. 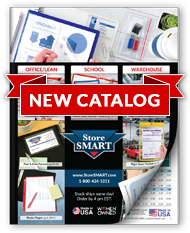 Use them on any magnetic or metal surface to post inventory controls, employee IDs and business cards, patient information and procedures, instructions, task or idea cards, labels, manufacturing formulas, benchmarking goals, and more. Each clear half of the holder can store several standard business cards. Need to incorporate small—but no less important—bits of information into your magnetic dry erase board-based visual management display at work? These holders do the trick nicely, and also give you the ability to color code information. As a bonus, you can write on them with dry erase markers! Each holder is crafted of polypropylene plastic—clear on the front, colored on the back. 2" x 3" magnet on back. Overall size: 4" x 9". Inside capacity of large pocket: 3 ¾" x 8 ¾". Inside capacity of small pocket: 3 ¾" x 2 1⁄8". Warehouses: Use these holders to label shelves, or to highlight different locations within your facility. Manufacturers: Do you use a magnetic dry erase board to track employee tasks or disseminate formulas for daily use? These holders are perfect for pairing employees with a job or formula! Schools: Easily provide your contact information for interested parents—just tuck your business cards inside a holder and stick it right on your magnetic dry erase board. Businesses: These holders make a wonderful addition to your Lean/Six Sigma/visual management arsenal. Now you can protect, highlight, and even color code any bit of information, no matter how small! Healthcare facilities: Pair an employee photograph with job duties or identification, and then use the holder to indicate floor or room assignments on a magnetic map. Magnetic Closure Pocket - Plain-Back - 8 ½" x 11"
Magnetic Closure "Idea Card" Pocket - Plain-Back - 4" x 6"
Checkmark and X Magnets 24-Pack - 1 ¼" x 1 ¼"